Cultivating Solutions is a forward thinking company focused on providing arable farmers with innovative answers to field cultivating problems. 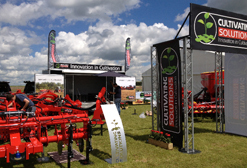 They design and manufacture innovative items of cultivation equipment. Since they approached us in November 2013 to undertake a a brand refesher, we have been requested to provide design and marketing support to promote their business. Its been a busy year for this up and coming business. Two outdoor exhibition events, design and print of their catalogue, dealer flyer and price list, wall graphics in the form of printed foamex boards and banners, pull up banners, vehicle decals, information panels, and flags were just some of the projects we completed for them.